I am pleased to announce the availability of my sister's first book! 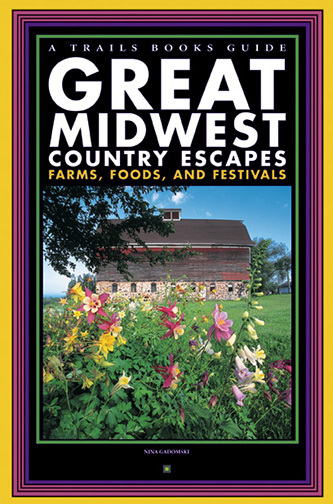 Nina Gadomski has written a wonderful midwest travel book. It provides a well written series of driving tours. This book is for individuals seeking a vacation exploring farm related activities. In the mood for cherry picking? How about a relaxing stay at Garst Farm Resort (the seed people) in rural Iowa? Or join the hunt for smoked fish on the shores of Lake Superior in Minnesota. Nina has started work on her second book. This will be a travel book for Wisconsin Trails publishing. It will be a Lake Michigan region travel book. More information will be posted here by 2007. Click above link for Amazon.com purchase. 26. Country in the City: This is Chicago? More commerce than corn and more skyscraper than silo, Chicagoland still makes room for real working farms that dig deep into a past which is almost, but not quite, paved over. These are the living history farms, and the area has a surprising number of first-rate examples. Here the costumed interpreters roll up frayed sleeves and cut wood to build new outbuildings, scenting the air with sawdust. They muck out horse stalls, rinse dinner dishes in soapy tubs outside and don protective mesh to pull honeycombs out of clean, white hives. Instead of just telling you, they show you what life was like and sometimes…. East of the windswept Loess Hills, rows of corn and soybeans undulate across west-central Iowa. Here and there, the roofs of old barns sag in the way of old couches, but with an unmistakable antique quality. This is the part of Iowa where, back in the 1860s, Danish immigrants came to farm, to erect tidy villages, to mix up batches of æbleskiver, and to stay forever. Today they represent America’s largest concentration of Danes in a traditionally rural setting. Come for a taste of Danish culture and hospitality, and let the people tell you of the love story that brought a windmill from Denmark to Iowa. It is the story of an entire community’s love for a shared heritage, and it happened long after…. Where sand meets surf at the far northwest tip of Indiana, people come to play. Here in Porter County, dunelands decorate the shoreline of Lake Michigan like frosting on a cake. Swim, have sun-baked summer fun and never mind the occasional steel mill. But when it comes to farms and foods, venture a little inland to the smattering of old farms and young wineries. You will encounter plenty of places named some version of port. It can get a little confusing…. The Kettle Moraine lands of southeastern Wisconsin are home to a 576-acre snapshot of the state’s formative years, especially the land depressions called kettles. The region is also where Wisconsin’s last electric trolley runs on a regular schedule, mostly for people out on a lark, but also, in a nod to community service, as a hauler of freight that includes agricultural products. There is a lot more to like here, from a barn painted with a smile as if the old building itself relishes the farm-fresh foods that are stashed inside, to places where visitors can pick fruits, ride horses, and get all mushy over baby animals. Put it all together, and you have a region proudly retaining its rural character, and all so surprisingly close to Milwaukee and Chicago. How close? From Milwaukee…. Michigan’s lower left-hand corner has so many orchards, roadside stands, and farm markets under its Fruit Belt that you could not possibly visit all of them in a single weekend. Signs tacked onto telephone poles and stuck into the ground at the country crossroads will always tell you what season it is: “Asparagus, One Block,” “Nectarines, Three Miles,” “Pumpkins for Sale.” For this is the country’s largest non-citrus fruit-growing region, and a fresh and colorful produce section all its own. So find out when your favorite fruits and vegetables are scheduled to ripen, and drive out to…. This weekend, why not go off in search of something wild – wild rice, that is. The Minnesota DNR lists 74 Rice Lakes, Wild Rice Lakes, Big Rice Lakes and Little Rice Lakes in Minnesota. More wild rice grows naturally in these cold northern waters than in any other state. Native Americans continue to hand-harvest the tasty and nutritious seed-heads. The wild rice that you buy is either called “lake,” which means it grew naturally in a lake, or “cultivated,” which means it was grown in a paddy as a field crop. Wild rice is a prized restaurant menu item. It is often served with chicken, and pheasant when you can get it, but it is also a fine accompaniment to another Minnesota swear-by – walleye. A pilaf of wild rice might include…. Tours will take you through six midwestern states. Ideas for various activities and accommodations are included. Tour maps are included. Interviews on the ways of farm life are provided in "Sidebars." Please click the Amazon.com link for purchase. June 15, 2005 : Thief River Falls, MN radio interview, book based listener trivia with book giveaway. June 22, 2005 : WILL Radio, Champaign, Illinois, June 22 at 2:40pm. Listen to the streaming internet broadcast here http://www.will.uiuc.edu/am/aftmag/thisweek.htm This broadcast will be heard on the Afternoon Magazine program. July 8, 2005: WDLB AM Marshfield Wisconsin radio interview with Ryan Lindsey. 35 minute interview and book trivia giveaway. February 23, 2006: Kohler Wisconsin All Wisconsin Travel Show at the Kohler American Club. Speaking engagement and book signing. Kansas newspaper: The Witchita Eagle. On-line book review here.